Yesterday I managed to sneak in a ‘boat other than Cambria’ and I think I got away with it. Today a couple of rather nice pictures of another but this one is at least closely related being the sailing smack belonging to our 1st Mate, Denis Johnson. 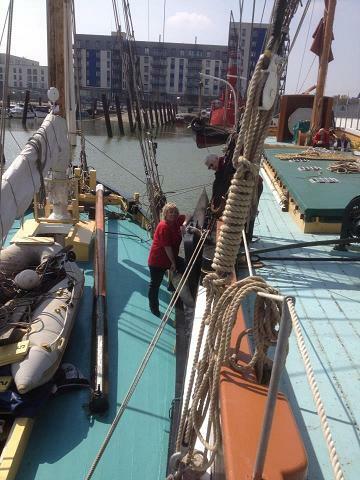 Here she is moored alongside Cambria at Gillingham pier with Carole Pettipher smiling up from her deck. She is Doris LO284 and is a Harwich “Bawley” built originally in 1909 by famous boat builder and shipwright, John Cann. 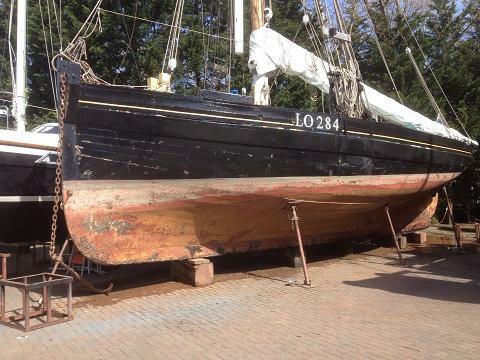 She has had no end of continuing restoration while in Denis’s hands and looks superb in her new paint. The Bawleys get their name from the word ‘Boily’ – they were used for shrimp fishing and had a big boiler aboard so that the shrimps could be boiled on the way back to port to improve the retention of flavour and condition. For more information on Doris, there is a website at http://www.smackdock.co.uk/smacklist/doris/doris.htm but I regret that I cannot review it for you as my bandwidth ‘over here’ is not up to opening this one! My partner Arthur & I were at Upnor today, and saw Doris moored up at a buoy not far off Upnor Castle, and noticed there was a film crew on board, we just wondered what they were filming please, as it looked like the person being filmed was in uniform, white trousers, jacket, with gold sash, some sort of 18th century officer Marine uniform maybe? We were just curious!